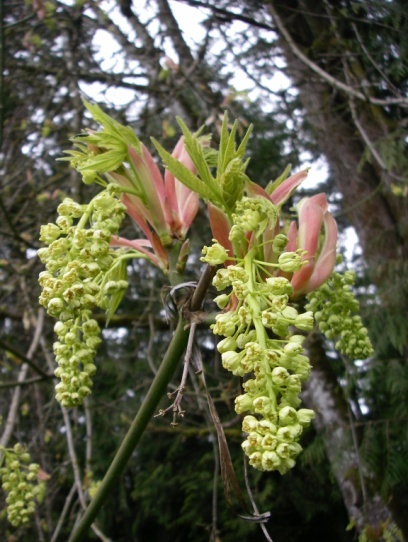 Names: Big-Leaf Maple, sometimes called Oregon Maple, derives both its common name and its scientific name, macrophyllum, from the fact that it can have leaves up to 12 inches across–the largest of any maple! 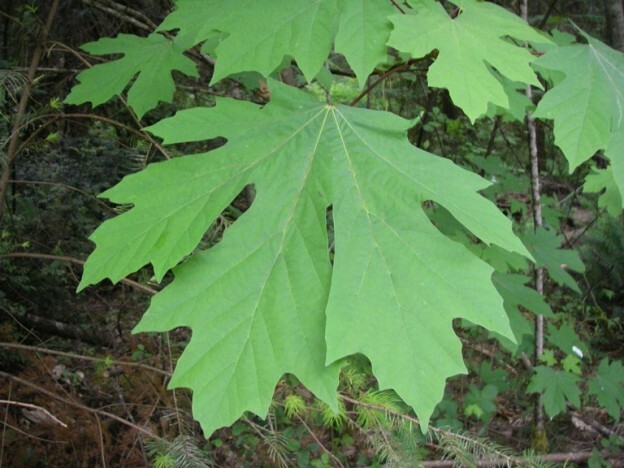 Distribution: Big-Leaf Maple is native to the Pacific coast from southeast Alaska to southern California. 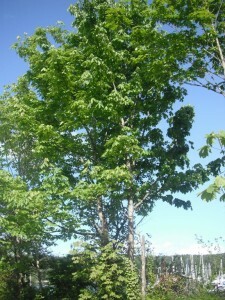 Growth: Big-Leaf Maple grows rapidly when young, more slowly as it ages. It typically grows 30-75 feet (10-25m) in cultivation but can grow more than 100 feet (30m) tall. It is a spreading tree with a rounded head and may grow nearly as wide as it is tall. The trunk can grow to be more than 3 feet (1m) in diameter. 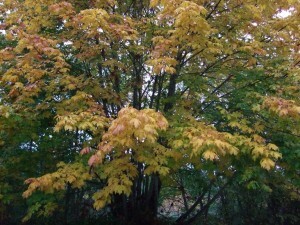 Big-Leaf Maples may live to be 200 years old. 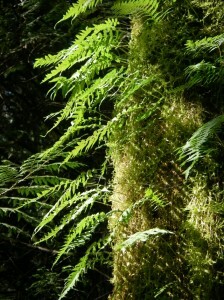 Big-Leaf Maple branches are often draped with mosses. Habitat: Although Big-Leaf Maple will grow on drier sites, it is often found along stream banks and does best on similarly moist sites—its leaves will grow bigger and more impressive when growing in moist, shady areas. 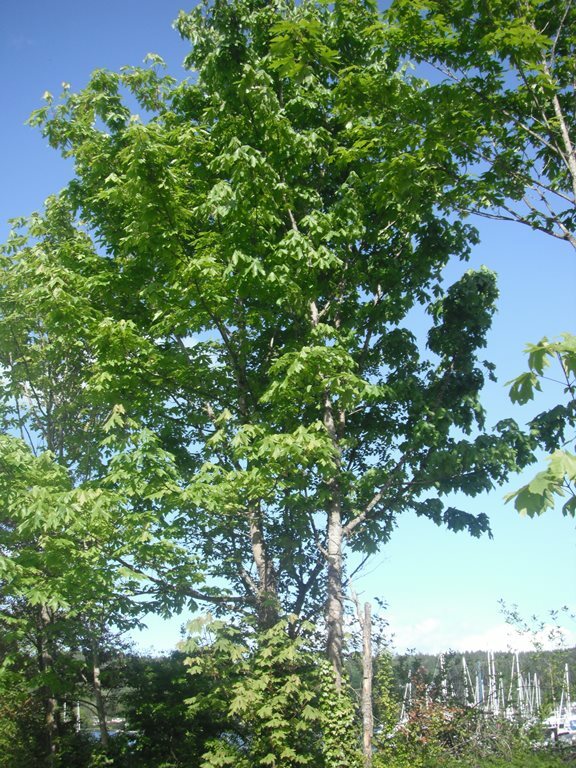 Diagnostic Characters: Big-Leaf Maple is easily recognizable by its large 5-lobed leaves–often 12-inches (30cm) across, but sometimes much smaller– 6” (15cm). In the spring, greenish-yellow flower clusters emerge before or with the leaves. The seeds are the typical paired, winged samaras or “helicopter seeds” of maple trees. 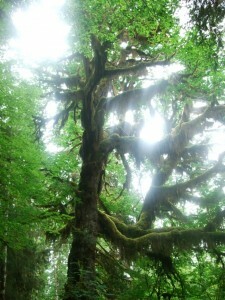 Big leaf Maple in spring. 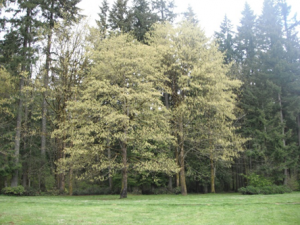 In the Landscape: Although this tree may be too big for a small yard, it is impressive in larger yards and parks. It effectively creates a shady and cool environment beneath its leafy branches, an ideal place for a picnic on a hot, summer day. In fall, the leaves turn yellow, turning brown after falling, creating a carpet of large, brown leaves persisting through the winter. 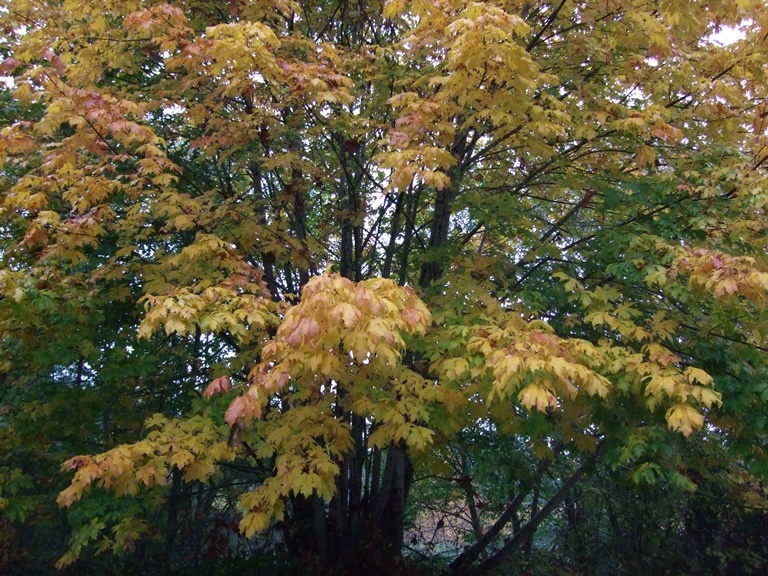 Big leaf Maple in Fall is usually yellow, but sometimes tinged with orange. 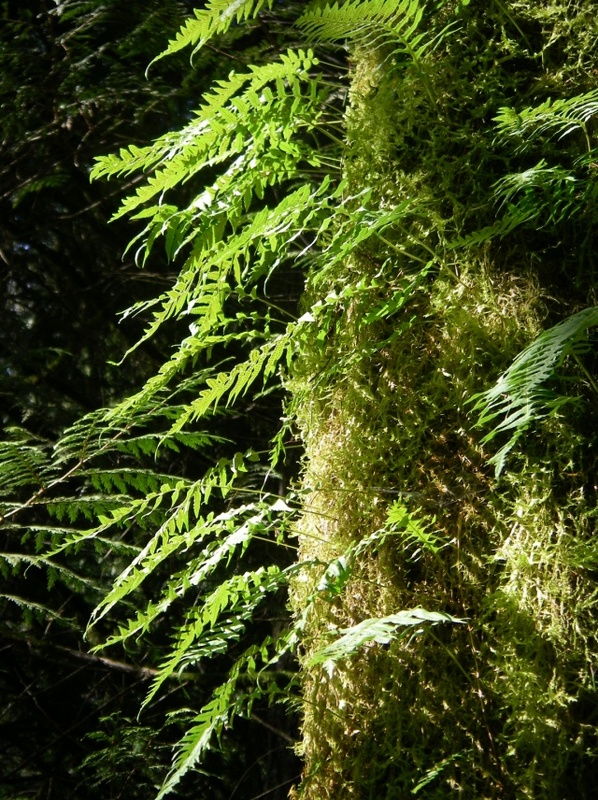 Licorice Fern and Mosses on Big Leaf Maple. This majestic tree is made even more interesting by the life it supports. 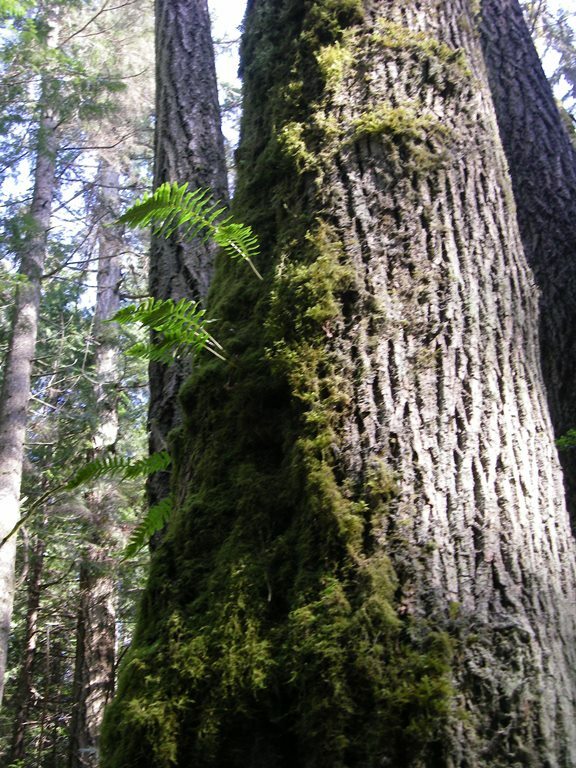 Its deeply ridged bark creates and ideal habitat for epiphytes (plants that grow on trees without soil), including many species of mosses and lichens as well as the Licorice Fern, Polypodium glycyrrhiza. 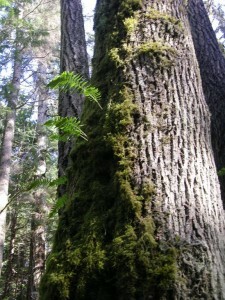 When you see a tree covered with moss, you can be pretty sure it is probably a Big-Leaf Maple! As the moss-layer thickens and begins to decompose enough soil is sometimes created for tree seedlings to germinate. Phenology: Bloom Period: March to June before the leaves appear. Double samaras ripen September to October; most are dispersed by wind between October and January. Propagation: Seeds do not store well. They are best sown as soon as they are ripe outside or in a cold frame. Germination occurs in late winter or spring. The seeds may also be soaked for 24 hours or warm stratified for 1-2 months, then cold stratified at 40ºF (4ºC) for 2-6 months. Seeds and seedlings need to be protected from rodents, slugs and other, herbivores. Use by people: Natives found this tree very useful. Some used the bark for making rope. The leaves were used for containers or in cooking pits. The wood was extremely popular for carving both artwork and useful items such as dishes and paddles. Sprouted seeds were also eaten. Maple syrup can be made by boiling down the sap. The greenish-yellow flower clusters make a tasty garnish for salads. Commercially, the wood is mostly used for making veneers for furniture, but is also used for musical instruments and interior paneling. Burls are used for clocks and tabletops. Use by Wildlife: The seeds, buds and flowers of Big-Leaf Maple are a favorite food of many small mammals and birds. Douglas squirrels will cache the seeds. Flower clusters are often found on the ground after they have been nibbled on by squirrels. Deer and small mammals eat seedlings and saplings. 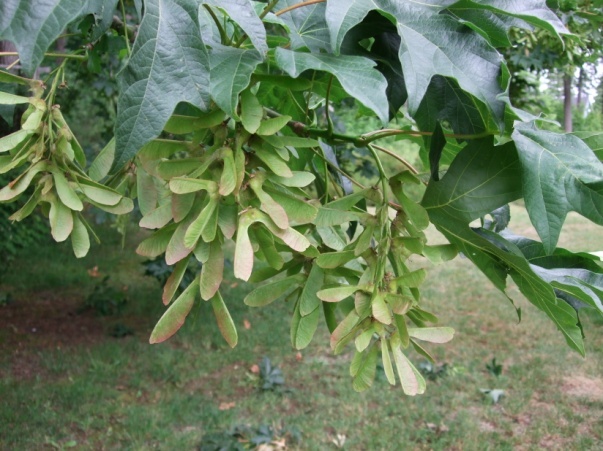 This entry was posted in Broadleaved Trees on May 13, 2015 by habitatdana.